Our website http://www.fishingkites.co.nz is being updated daily. To ensure you are getting all the latest information use the refresh button when you log onto the site. Another great weekend for kitefishers is on the way. Time to get the gear out and head to your favourite east coast beach to catch those schooling snapper. A high in the Tasman Sea is approaching the country and will bring westerly winds to the North Island on Saturday. The wind will go more to the southwest during the day and increase in strength. The South Island will have strong southwesterlies. The strong southwesterlies will continue for the North Island on Sunday. The wind in the South Island will be southerly and strong. I was fishing at Muriwai in June with a Dropper Rig. We put out one set of ten hooks and caught this beauty snapper. It weighed 17lb. We also caught two other snapper which were 3lb and 5lb. One shark was brought in on the same set. All the hooks were baited with mullet. We had so much fish after the first set we didn't need to do any other sets. This weekend we had our first snapper landed for the season. It weighed 1.36kg which is small by our usual standard, but it's a start. Mr G Hart from Fielding was the lucky fisher. He used an electric kontiki and was fishing in front of the Country Club. Mr Hart arrived with three of his mates at 6.30am on Saturday and they fished all day. They caught a total of 32 gurnard, one snapper, two kahawai and a skate. Another record fish has been landed on Porangahau Beach. Gary Kemsley from Napier caught a 1.58kg gurnard on a surfcaster rod. The previous record for the Hawkes Bay Surfcasting Club was a 1.41kg gurnard. Saturday morning started off with a 30 knot westerly wind gusting to 45 knots which dropped away to 10 knots in the afternoon. The wind was up to 60 knots by early Sunday morning. A few campers packed up and headed for home before daylight, due to the wind. There were quite a few kite and kontiki fishermen on the beach on Saturday in the ideal conditions, with a number of good catches being recorded. James Fringe was using a Super kite powered rig and landed a chilly bin full of gurnard. His best gurnard weighed 1.2kg. James was fishing last week and his mainline got snagged on a rock. He managed to paddle out in his kayak and recover the line complete with a live skate still hooked on it. Murray Kinred from Taupo had another good day on the beach with his kite powered rig. Murray caught lots of fish and his best gurnard weighed in at 1.22kg. 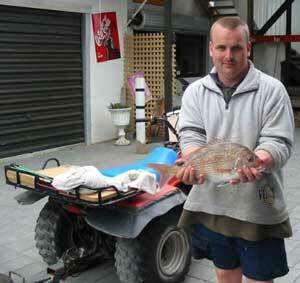 Brett Harris from Waipukurau also had a great day on Saturday, his best gurnard weighed 1.44kg. Don't forget if you are in the area call in and catch up with what is happening on the fishing scene. If you are looking for an area to camp and fish, check out our free camping ground on the beach. It's only a 20 metre walk to put your Paul's Fishing Kite in the water and catch a feed of gurnard or snapper for dinner. Don't forget to weigh your fish in at Beach Marine if you are fishing at Porangahau Beach, some great prizes are up for grabs in our free fishing contest. Ring us for more details. I went with three others to the Mokohinau Islands on RnR charters last week. We were hoping to get into the big snapper which the Mokes are renown for. The fishing was slow to start with but by the end of the day we had snapper, john dory, a small hapuku and lots of pink maomao. Mark Roberts was the lucky angler and he was very happy to have landed the best fish of the day, a snapper weighing 17lb. Pilchards and squid were the baits that were working although we did try some freshly caught spanish mackerel and other fresh bait. Barracouta are still in the deep water and we managed to hook into a few of the toothy creatures. The snapper were all full of roe and in very good condition. We pan fried a few of the fish and the pink maomao was a pleasant alternative to snapper. It would have to rate as one of the sweetest tasting fish I have ever eaten. After being left in the fridge overnight the maomao fillets tasted even better, almost as sweet as crayfish. The rest of the fish were put in the smoker. It is concerning the water temperature is still very low, we had 12.9 degrees at the Mokes. Reports from fishers all the way up the north east coast indicate water temperatures are down at least two degress from previous years. Hopefully by the time summer does arrive we will have an extended fishing season going into next winter. 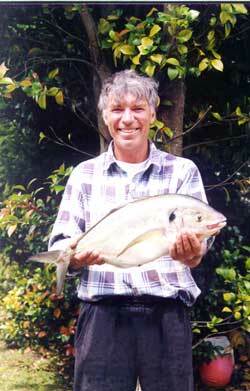 The trevally hunt continues on the Manukau and the fish are moving further up the harbour. Although the fish are getting bigger they are still lacking in condition. A rise in water temperature should see the fish fattening up. Most of the fish we are catching have very little in their guts. One kahawai we caught recently had 6 whole crabs in its guts. Shellfish baits are preferable if you are targeting the trevally.The kahawai will take just about anything, shellfish or fish baits. 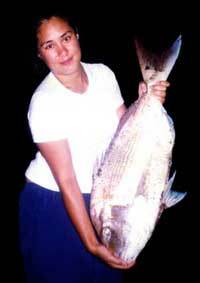 The trevally in the pic measured over half a metre long. These fish are great fun to catch and the 4/0 Target Hooks on light traces works very well. What a difference a couple of weeks make. This time I left the old fella at home and took the Princess, far better plan. Within 30 minutes of arriving at our spot on Pakiri Beach we had our kite powered Bottom Longline set straight out 700 metres with 13 hooks attached. Forty minutes later we pulled it in and caught nothing. We put out another set and brought in one snapper. Getting close to leaving we decided, with still enough squid in the bag and so close to bite time to do one more set. Out she goes with 25 hooks, the full 1000 metres, (this after being warned I'll never get it back in). This time we left it out for an hour. The tide was well out by the time we were ready to pull the gear in which was excellent as I was able to walk from the waterline all the way up to the dunes. 17 times we walked, the princess doing her share of seven. We had the big kite in in no time at all. Five snapper. What a pleasant sight. These were all caught on the last seven hooks. These were very similar in size to the snapper I caught last time I went out. I also managed to catch three gurnard the last time I was kite fishing. Things are looking up!! In the past fortnight the offshore winds have started to blow occasionally. If any of you out of town kitefishers come to Mokau, it's usually only good from daybreak to about 9.00am when the forecast winds blow. The only exceptions are if an easterly flow is forecast but these are rare in Mokau. Two weeks ago my first few sets produced a mixture of a few gurnard and a lot of sharks. Last week the sea was cleaner and I set the kite off from Seaview Motor camp using fresh kahawai for bait. I caught 21 gurnard and no other species. It was my best gurnard tally and most of them were big ones. The wind was still blowing so I set it again and caught 19 gurnard, one kahawai and a spotty shark. This was a good haul and I never have any problems giving fish away to my fishing mates, family, friends and the locals. I wrote in last week with my catch report from Waipu Cove. I do a lot of diving in the area as well and I thought I could offer some help. From past diving experience the areas from the second big sand dune after the end of the camping grounds down to the rivermouth has a lot of low lying reefs. These start at approx 800 metres off of the beach and range in depth from 15 to 20 metres deep. Some of them rise about 15-20 feet off the bottom. At the southern end of the beach (near the boat ramp), the rocks curve in a northeast direction and end in flat ridges. Bottom longlines can be used here in a southwesterly but in summer the ramp is almost in constant use with boats being hauled in and out. The area from the surf club north to the second dunes is clear as far as we know. I'm currently compiling a map of the good dive spots (showing reefs) along the Waipu/Langs coast using the new GPS. I'll drop in a copy when its done. I went fishing at Otama Beach last week. The conditions were great with a moderate southeasterly wind and a slight sea. I set the Dropper Rig out with 10 hooks, all baited with mullet. Only one set and a return of three snapper and two gurnard. A great day to be fishing. Otama Beach is north of Whitianga. There is a metal road out to the beach. The beach is three to five kilometres long. It is a good sandy beach and excellent for kitefishing. I haven't struck any snags or foul when fishing there. I have caught fish anywhere along beach. You can get a bit of foul wind off the hills at times. The Kite Fishing Club had their annual trip away last weekend. Ten club members were hosted by Kevin Griffiths and Emma at their house in Ahipara. David Billings and Jamie Cullen caught the best fish over the whole weekend. Their 6.2kg snapper was caught at Rarawa Beach near Houhora. David and Jamie caught 12 fish between them and easily took out the club prize for the heaviest snapper for the trip. 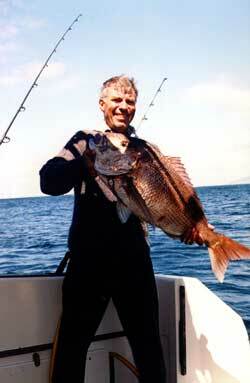 Early reports suggest most of the snapper landed were around 2kg and caught off Tokerau Beach. Full details will follow in next week's newsletter. Stephen Tapp from Stirling Sports in Whangarei reports that kite and kontiki fishers have been catching more fish in Bream Bay than the boaties over the past few weeks. Due to coldest October in 20 years sea temperatures are down and this is having an affect on the fishing. Apparently temperatures are slowly coming up and the Bay of Islands has water of 16 degrees. There have been a few fishing contests held in the Wellsford area lately. Sandra from Wellsford Sports and Leisure reports the latest Mangawhai tournament was won by a kayak fisher. His snapper of 7kg was the biggest recorded so far. Kaitaia fishers are into some good fish too. Fish over 20lb were being weighed in several times a week according to Diane from Laurenson Marine. This has recently slowed to one a week, but it's great to hear the good fish are coming in close. Tokerau Beach is also fishing well. Lorraine from Bayview Services reports one of the locals won a recent contest with a snapper of 10.4kg. This is encouraging news for those looking to fish the east coast this weekend. We are getting some great Beach Reports. Keep them coming.